Invasive species have become enormously dangerous to the Appalachian Trail. They can be either animals or plants. Some general examples of invasive species are: snakehead fish, Chinese Silvergrass, and Parrot-Feather. This exhibit focuses on the invasive flora that one may encounter on the Appalachian Trail. Invasive plants are not to be taken lightly on the Appalachian Trail, or anywhere for that matter. 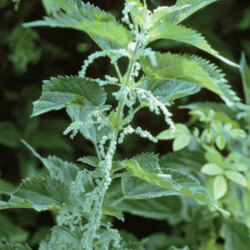 Some, such as the European Stinging Nettle, can injure humans. Others, like Parrot-Feather, can clog drainage systems and deplete the oxygen in water. Still others simply outcompete native species. The thing to remember is that invasive plants pose a major threat to the Appalachian Trail by causing bodily injury, damaging property, and harming the ecosystems there. On this long stretch of wilderness, invasive species are nothing new. For example, while it is not technically a plant, Chestnut Blight has been well-established in the eastern U.S. since the first decade of the Twentieth Century. This disease is caused by the fungus Cryphonectria parasitica, and it succeeded in killing off nearly 100% of the American Chestnut population by 1950. One example of an invasive plant that was introduced to the Appalachian Trail is the Water Chestnut (Trapa natans). It was introduced to the U.S. in the late 1800's for decorating aquariums. Unfortunately, it was most likely introduced into the wild when aquarists dumped their tanks out. The aquatic plant now floats in thick blankets in the waters of the Appalachian Trail, and its fruits have spines that are painful to step on. Notice that in a historical context, these two species were introduced to the U.S. around the same time period. One explanation may be the imports of plants during this era: Chestnut Blight was likely introduced by bringing over infected trees, while Water Chestnut was, as mentioned earlier, brought over for use in aquariums.